Is Your Flooded Basement Covered by Insurance? These policies are sold through your insurance carrier, but handled by the National Flood Insurance Program. Established in 1968, the NFIP helps property owners protect themselves following a flood. You must live in a community that participates in the program in order to qualify, so it’s worth a visit to the FEMA website to find out if your town has signed up. The NFIP says that flood insurance can be tricky when it comes to basements. Policies cover your home’s “foundation elements” and essential equipment such as circuit breakers, furnaces and hot water heaters. The NFIP recommends people get contents coverage and flood coverage, since the latter doesn’t cover things such as s finished walls, floors, ceilings or personal belongings kept in a basement. Now, let’s say your basement is flooded, but the cause isn’t a flood—rather, it’s a failed sump pump. Most flood insurance policies won’t cover the water damage in those cases. For that, you’ll need something called water back-up coverage, which typically covers things like water escaping from a sump pump or a backed-up sewer main. 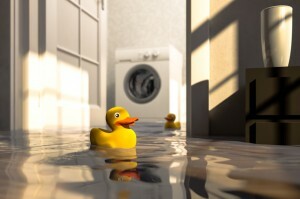 There are other types of basement water damage that may or may not be covered by your standard homeowners’ insurance. For example, flooding from a sudden leak — whether it’s from a pipe, sink, tub, shower, toilet or appliance — should be covered by homeowners insurance. But flooding from groundwater seepage or a damaged water heater may not be covered. It’s a confusing process, and probably not something you want to think about when dealing with flood damage. This is where a licensed public adjustment firm, like Interstate Public Adjusters, can come in handy. When you need to file a claim with your insurance company, a public adjustment firm can help. Filing a claim can be an incredibly complicated. A public adjuster can help you understand the process and safeguard your interests at the same time. The public adjuster works for you, not your insurance company. Their compensation is based on the final payments our clients receive, so your interests and theirs are intertwined. After flooding happens, a public adjuster will examine the damage, review your insurance arrangements, and help you talk to your insurance company. The insurance company has every right to send its own claims representative to examine the damage, but has no right to stop the public adjuster from acting on your behalf. The public adjuster will help you file your paperwork, and press your insurance company on making payment. Meanwhile, you can worry about your flooded basement. It’s tough dealing with more than one crisis at a time, and a flood is one of life’s bigger ones. Let your public adjuster help. If a flooded basement or a natural disaster of another sort has caused damage to your home or personal belongs, contact us immediately. This entry was posted in Ice & Storm Damage, Storm Damage and tagged flood damage, homeowners insurance, water damage by ipajamin. Bookmark the permalink.